The Challenge: #4, Gender Bender. 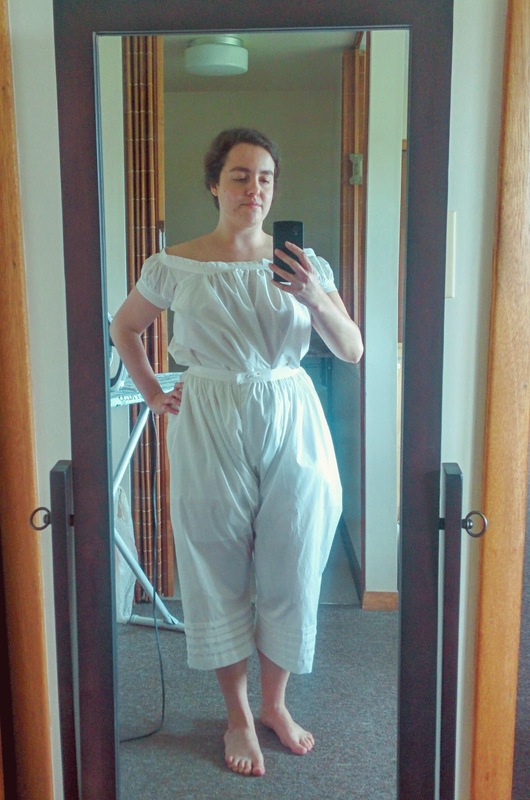 I know what you're thinking, but if we go back a few decades drawers were really controversial for women - they simply didn't wear bifurcated garments. So even though I'm not aware of the attitude that drawers were inherently gender-bending still existing in the middle of the nineteenth century, I'm counting it because I really need drawers for my presentation. 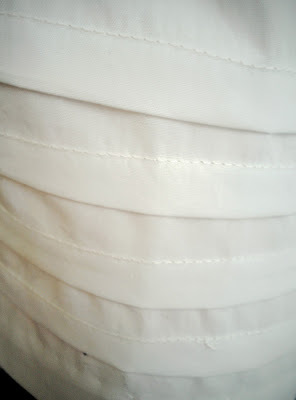 Fabric/Materials: White Pimatex cotton from Dharma Trading Co. at $6.79/yd. I'm not sure of exactly how many yards I ended up using - after making my chemise, there was only enough left for one leg, so I bought two more yards and didn't use all of that. I think it's probably about two yards in total? Pattern: From the drafting instructions by Liz Clark on the Sewing Academy Compendium. I was going to get out a pair in the collection and pattern them and base mine off that, but then I realized that that made no sense. The instructions are very clear and simple and I recommend them. Year: These could work for a good portion of the century, stylistically, from the 1840s (at least? I don't know much about 1820s-1830s drawers) through the 1880s and into the beginning of the 1890s, until sheerer cottons and lace and ribbons started to become a big part of lingerie. Although there are certain decorative trends you see changing through the years - cutwork in the 1850s, handmachine whitework in the 1870s, etc. - they can basically work for a broad swath of time. Notions: They will have a button at the center front, but I really need to move on and get cracking on the corset for the current challenge. How historically accurate is it? As usual, I'm aiming for high accuracy! The end result looks exactly like extant drawers I've handled in museum collections, although my tucks are maybe a little bigger. Next time I do any tucked underthings, I'm going to aim for 3/8" instead of 1/2", and I should have done the gathers by hand instead of by machine (both for accuracy and, because I have a Tension Problem, the fabric was really hard to gather after doing the two lines of stitching). 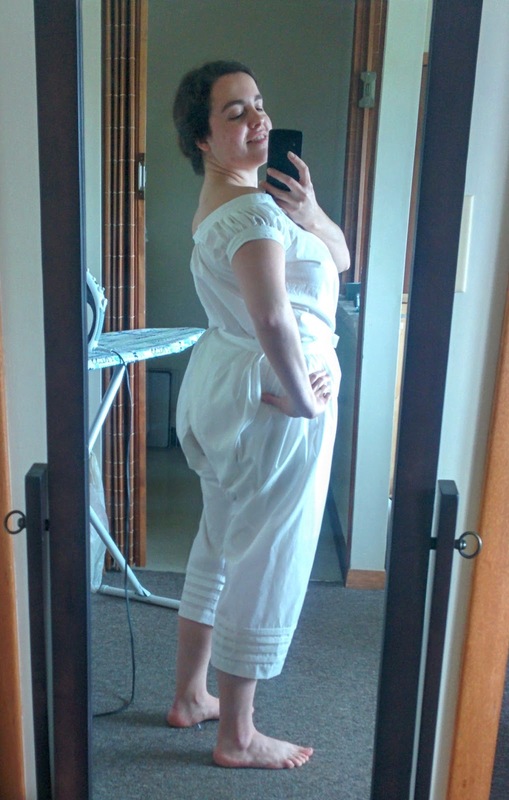 But if I didn't have confidence that this long-legged diaper was historically accurate, would I show you how completely unflattering it is? Hours to complete: I should just stop keeping this line in my posts, because I will never remember to keep track of my time. I think I worked on it on about five non-consecutive days. Was this sewn on your treadle machine? The stitching on that closeup...beautiful! I wish my plastic Singer could do it as well. I sew everything on the treadle! This was especially cool, since it's the kind of thing that the machine was probably used for back when it was new. I have a treadle machine my parents found at a resale shop--I must get used to working with it!